This hourglass underbust will give dramatic shape to your body. Made of solid, black jacquard with floral patern. 20 spiral bones provide comfort and fit perfectly to the body, especially in curved areas. On the back are 4 flat metal bones, which provide additional support. On the front there is very wide, flat bone with busk. 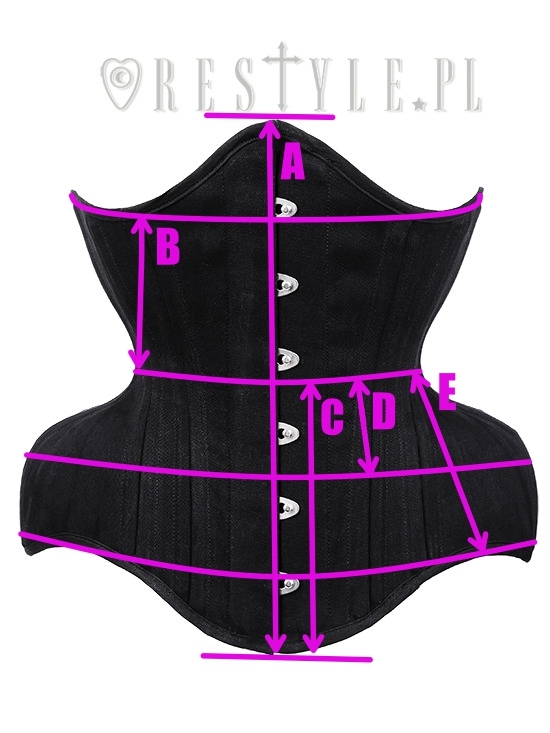 All Restyle curved corsets have waist tape, which serves as protection for the seams. Measure your actual waist at it's narrowest part, minus 4-7 inches from it (10-17 cm). 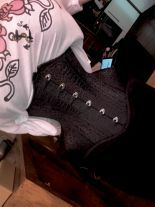 I ordered a 26” brocade underbust corset after hearing many positive comments about Restyle products. Shipping time from Poland to the east cost of the United States was impressive. My corset arrived in less than three weeks from the date of purchase. However, I was dismayed to find that my new corset was seriously defective. The two halves of the corset did not match in shape, and therefore both the busk and the back lacing were sharply slanted. I immediately emailed photos of the defective corset to Restyle. Customer service was prompt and polite, but Restyle was unwilling to pay for return postage. Even though the return policy states that Restyle may not require a return when photos are submitted, I was informed that I would have to return their faulty product at my expense. Since, once all postage and fees are paid, this would significantly reduce my total refund, I decided to chalk this experience up to a lesson in “buyer beware” when ordering products from overseas. My First Corset! And I love it! Shipping was right on spot. A day late due to MLK Jr. Holiday. Item was packaged well. I purchased a 32". I'm US 18/20; XL/xxl. My measurements are 41, 39, 51. Pear shape. The laces were just barely long enough to get the busk together. After reading other reviews, I chose the 32" rather than the 34" BC this pattern runs large and I'm squishy. My first wear was very comfy. Nice back support too. This is a great alternative to hip ties. Has a good hip shelf. It made my figure smooth and defined. I am very happy I purchased this Corset. I wish they came in more colors, but it is a goth site. Overall, the corset seems sturdy and the stitching looks good. Thanks Restyle! 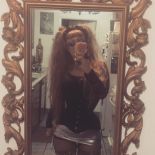 I ordered a 26" corset and was very happy with the general construction and beautiful fabric but it was seriously faulty in that the two halves of the corset were not matched for shape so the busk and back were slanted sharply diagonally rather than being vertical. It was also too small for me. I sent photos and Restyle arranged for it to be collected and returned. Restyle replaced it with the same style of corset in a 28". This too had the same fault. I emailed photos and Restyle arranged to collect it to be returned. This time I asked for a refund and this was done. I have bought a different style corset from Restyle before and have been very happy with it. However, either I was very unlucky this time or there was a faulty batch. Restyle customer service were very helpful. I was disappointed that I had to return the corsets in order to arrange an exchange and then a refund. The packaging information states that this may not necessary when photos are submitted and the fault it obvious. When I asked about this, Restyle explained that it is always necessary to return faulty corset in order to arrange an exchange or refund so the packaging information is not accurate. Having the return the corsets meant a long delay from first ordering to obtaining a refund (16 Nov - 3 Jan) and I had ordered the corset to be available for Xmas. However, as mentioned, customer service was excellent, previous purchases have been very good quality and the overall quality of this corset was very good. I loved the design, which is very flattering and well suited to my body shape. I would not hesitate to order a corset from Restyle again. If I cannot find a suitable alternative, I might well try again with this corset and hope that if there was a problem with a particular batch that it has now been resolved. This corset is very comfortable and creates a great shape on my short torso. I am using it for corset training and I wouldn't want any other corset than this one for the job. The bones are strong yet comfortable enough that its practical to wear it most of the day without issue. The fabric is sturdy and it overall a great product that i recommend to anyone whos interested. this is the second corset i bought from this company and I intend to buy more in the future. This corset gives amazing shape! I love the hip spring and conical rib. It is a very well constructed corset for the price in my opinion. 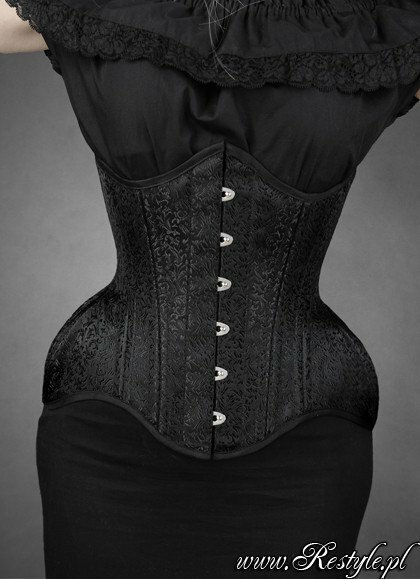 It is better quality than a corset I have from a well known affordable brand which was $60. I know that improvements have been made to this model over the years (for example the addition of a waist tape, and corsets measuring to size. That's right, they no longer run large as in previous reviews!) The fashion fabric is absolutely jaw droppingly beautiful. I'm very happy to find a non-custom corset with measurements that accommodate by body and don't pinch my hips like others often do. For reference, I have the 18 inch size, which I am currently wearing with a 1-2 inch gap now that it is fully seasoned depending on how my body feels on the day. My natural measurements are 27-25-32. I would advise consulting the size guide and choosing one that matches your natural underbust and hip measurements closely - those can't really be compromised on. Well made corset, very pleased with it. I'm really happy for this underbust. I recive it so fast and I'm so so so impress. Cheap and really high quality, I love it. Another scrumptious piece by restyle! The fit is fantastic, the materials are chosen and constructed so that this corset is made to last. You feel as if this corset was made to measure rather than otr. If your looking for a beautiful silhouette, you have found it. The value of Restyle is amazing, even with having to ship overseas to the US. They insure that you order is safe and secure, and that your delivery is given priority status. My favorite corset. Quality and beautiful. I get tons of complements. Just bought another, I love it. Also went a size down, from my usual 22" to 20". Not a big difference, only runs about an inch big. A beautiful, well constructed corset. I find that it runs true to size and it is very comfortable as well. The flat laces are very practical and ensures easy lacing. You get a lot for your money with this corset! This corset is so beautiful! It makes a perfect hourglass shape! Really gorgeous corset, great fabric. I've had mine for about a week now and still in love with it. I've had some weight gain in the last few months so probably ordered a size smaller than I should have (ordered a 22 probably should have gotten the 24 instead), but regardless it's super comfortable even though I'm fairly widely laced right now. I think so far this is the most comfortable otr corset I have purchased and despite having a longer busk I feel more mobile in this corset than my older well broken in corsets. I can't wait for my second restyle corset to arrive in the next week or so! I spent ~$80 CAD inclusive on this corset and I'm feeling like it is one of the better deals out there. I ordered a 20" which fit comfortably (37-28-37 are about my measurements; 30 is my underbust and I have a hip spiral of about 10 so this was a good size for me). Do order one size down (according to the charts, I should've ordered a 22"). I received this in about 2 weeks which is excellent for international shipping. The material and detailing is gorgeous. Love this corset. Very sturdy . It gives me the shape that no other off the rack corset that i have does. I mesure the inside and it's true to the size not like a few reviews that i read saying it's a few inches bigger. I do recommend for waist training. I'm waiting for the black matt get back in stock so i can get that one as well. Over all I'm quite pleased but i did have a couple issues I'll talk about. Busk: inch wide. Stiff and sturdy. Knobs are a bit big for the loops but it's ok. Modesty Panel: 6 inch unstiffened modesty panel and a half inch front modesty placket. Both are inn the same fabric as the fashion fabric. Fabric: Very pretty fabric. No real issues but on the top right grommet some white fabric was sticking out. Dont know why though. Has a visible waist tape. Stitching: No visible issues. Binding looks nice as feels smoothe. Laces: Flat, semi-stretchy shoelace style. No complaints. Grommets: One grommet was completely deformed and had to be fixed as it was trying to tear the laces. The rest had small splits but they did not catch so they're fine. Shipping: Fast and cheap. However, they failed to include the state it was sent to and it got stuck in customs. Package was torn up as well but i think the post office did that. Customer Service: Not bad, although they told me not including the state would not be a problem. While going to verify the package was not a big deal I shouldnt have had to. But like I said I'm satisfied over all. The quality was good for the price and it looks good on. I love this corset. It will give you nice curves even if you have slim hips. I bought one size smaller than I usually buy and it turned out to be a good choice. You can wear it very tight an yet very comfortable! There is just little bit too much space in the hip parts, could be little bit more flat for more natural look. Oherwise very nice and high quality corset! Very beautiful and well made corset. Runs a bit large but nothing that would prevent me from wearing it. I'm really happy with this. It has a great silhouette and the fabric is gorgeous. Awesome for the price. I love this corset, very well made, although I think it may run a lot bigger than the size on the chart. It fits more like a 32 than a 30 which is what I ordered. I love the quality and the look is beautiful. Unfortunately I will not be able to wear it as it fits me very loose. I would still recommend it; although I would suggest ordering at least a size down than you would normally order. This corset is lovely I love it so much my only complain is the lace and how it was laced when it was delivered. Lace is too SHORT and it was laced improperly and it's a good thing I'm not new with corset or else I'll have a hard time for sure. Customer service is great though!!! Beautiful fabric and construction, and great fit for my short torso and wide hips. I was pleasantly surprised by the very good quality and fit, as I´ve had trouble with ready made corsets in the past.